A coat of armor for your rifle, engraved with our family’s coat of arms. 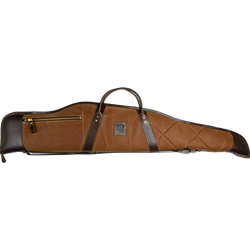 This scoped Rifle Case protects your prized firearm with style and safety. Includes a 2-inch clearance at all points surrounding the scope, a padded interior and durable leather accents. Available in 18 oz. waxed canvas.